1. Traditionally, the Hobart City Council loosely divided between "pro-development" councillors and councillors who stress environmental issues and/or the interests of impacted residents. 2. This term of Council has continued a trend from late in the previous term in which voting clusters have weakened and the voting of individual councillors has become much less predictable. 3. Despite this most councillors can at least be classifying as leaning towards the "pro-development" ("blue") mindset or its opponent ("green"). 4. The results of votes on this council have been very unpredictable because of the weakness of the voting patterns observed, the narrow advantage in numbers for the "blue" side over the "green" side and the frequent absence of various councillors from meetings. 5. A possible ordering of councillors from "greenest" to "bluest" in this term is: Cocker, Burnet, Reynolds, Cooper (no longer on Council), Harvey, Ruzicka, Sexton, Briscoe, Thomas, Christie, Hickey (no longer on Council), Denison, Zucco. 6. Possible causes of the weakening of vote clusters include personality clashes within the "blue" side, a lack of solidarity or a common approach to most council issues among endorsed Greens, and genuine changes in the views of some councillors over time. In the leadup to each set of Hobart City Council elections I post a detailed account of voting patterns on the Council in the previous term. My findings for the 2011-14 term can be seen here, and that piece includes links back to older pieces. Now that terms are four years long, this is a much bigger job than it used to be, but at least it only needs doing every four years. Entering in the data from something like 84 meetings, every single one of them with at least one contested motion, took me much of the last few days. But it was worth it; the results are rather interesting. For a general introduction to the nature of Hobart Council politics see the Council Landscape section in the 2011-2014 edition. As noted there, I've found over the decades that council politics is most easily analysed through the prism of "development" versus "environment" politics, and that councillors can usually be assigned to two clusters. The "blue" (=right-wing) cluster is the pro-development side, often including councillors with past or present Liberal Party links, and the "green" (=left-wing) cluster is the environmental politics side, increasingly dominated by endorsed Greens. This way of looking at things doesn't work for nearly everything, but it's kept coming up as the big picture in Council voting patterns, so I don't see it going away any time soon. Over the last few decades the Council has usually had slightly more of a blueish than a greenish tinge in terms of total numbers, but the leadership positions have been a different story. It's only at the last two elections that the blue side has recaptured those, with Damon Thomas and Ron Christie winning Lord Mayor and Deputy in 2011, and Sue Hickey defeating Thomas in 2014 with Christie retaining his position. The blues had a strong result at councillor level in 2011 but tensions between Thomas and others didn't help their cause, and in 2014 the left picked up a seat through independent Suzy Cooper. The other new councillors were former Liberal candidate Tanya Denison (who won the last seat by three votes at a key exclusion point) and Anna Reynolds, who unseated fellow endorsed Green Bill Harvey. During the 2014-8 term there have been two changes in the Council's membership. Cooper resigned in March 2016 and Harvey rejoined the Council on her countback, meaning that for the first time the Council had four Greens. In March 2018 Hickey was elected to state parliament and resigned her Council seat. As a result Christie was promoted to Lord Mayor (in which role he's been highly controversial) and Peter Sexton was elected around the table as the fill-in Deputy. My sample for this article goes up to the 9 July 2018 meeting. (Two more meetings have been held since then but their minutes didn't go online until after I had finished entering data and started processing.) Firstly a note that I have avoided using the term "aldermen" in this article. Although it is still the current official term for Hobart councillors, it is disapproved of by the present Council and appears to be on its way to the bin. Before I get on to the agreement matrix and PCA graph and so on, just a few words about how I do all this. In measuring the voting patterns on council, I'm interested in who agrees with who on the biggest share of contested motions. For this I place the most emphasis on motions that had at least two councillors on the voting for each side for the serious stats. Most motions passed through Council are unanimous, but unanimous motions don't tell us anything (and there are lots of those). When it comes to lone dissents, some councillors are very keen on recording them but other councillors may not bother signalling their disapproval when it's unclear anyone else shares it. So I exclude lone dissents from the main part of my analysis. In my analysis I count all contested motions except duplicates. A duplicate is defined as a vote with the same lineup on the same issue at the same meeting. For instance the Council votes 5-7 on a motion to refuse a development and then the same voting lineup in mirror image votes 7-5 to approve it. There is one very rare case in which I do count duplicates, and that is where the duplicates are ties but with the voting lineup flipped. 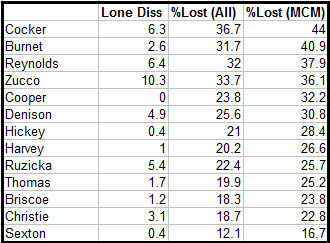 I include these because that makes the figures on who has been on the losing side of motions more accurate. The following is my record of how often each councillor voted on contested motions. Council meetings are held roughly every two weeks. Councillors are often absent from contested votes because they are on leave, either travelling away from Hobart (often on official council business including "professional development") or with other commitments. Councillors must also abstain on motions they have conflicts of interest on. Conflict of interest is, mostly, quite broadly defined and can even include just having commented strongly on an issue before it came before Council. However, absence (for all or part of a meeting) is by far the larger cause of not voting for most councillors. Peter Sexton had by far the highest rate of missed contested votes in my sample, missing about a third of them. Sexton, a doctor with a historically heavy load of other commitments, also had the highest rate of missed contested votes in the previous term, and high rates in the two terms before that. Suzy Cooper, who quit council finding it incompatible with her other work commitments, had actually had the highest participation rate in contested votes up to that point. Higher rates (in cases 100%) have sometimes been seen in previous terms. Some other things I look at is who casts the most lone dissents and who is most often on the losing side of motions. The following table is ordered by who is most often on the losing side of multiply contested motions (those which have at least two votes on either side). 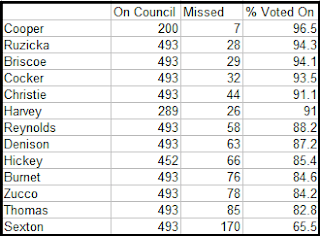 It also includes each councillor's rate of lone-dissenting (out of all motions they voted on) and how often each councillor is on the losing side of all motions. The most commonly outvoted councillors were three of the four Greens (Philip Cocker, Helen Burnet and Anna Reynolds) but notably not the fourth, Bill Harvey. However in the cases where Harvey appeared on the winning side of a motion but all the other Greens present were on the losing side, his vote was never decisive. Sexton has now been the least often voted down councillor in three of the last five terms, and the second-least in the other two. However, he was still voted down much more often than he has been before, while the loss rates at the top of the table are lower than they have been for a while. This greater spreading of defeats around partly reflects this council's closer green-blue balance than in the past, but I think there's more to it than that, and will discuss that further below. The following matrix shows how often (as a percentage) each councillor votes with each other councillor, subject to them both being present and to there being at least two councillors on each side of the vote. For instance, the matrix shows Burnet and Thomas vote together 42% of the time. With apologies to any colour-challenged readers, I've used dark green and dark blue to highlight agreement scores above 75% (a commonly used cutoff for funding clusters in this kind of work) and light green and light blue to highlight scores that are close to that level, in the range 70-74%. In the past I've used a complicated stepwise method to sort the councillors into an order. In this case I haven't done that but have just used a simple ratio of average agreement with those who are clearly on the green side (or at least significantly leaning that way) vs average agreement with those who are on the blue side (ditto). I believe the results would be the same in either case, and the exact order is usually debatable anyway. What is notable in this year's matrix (even more so than in the 2013-4 matrix) is that there is very little serious clustering. There is no set of three councillors who all vote with each other at least three-quarters of the time. This has never been the case before. At the ends of the spectrum there are two pairs (Cocker-Burnet and Zucco-Denison) with 78% agreement percentages within each pair, and very low agreement percentages with the other pair. There's also the grouping of Briscoe, Hickey and Christie, who have highish agreement percentages with each other, and are more supportive of Zucco and Denison than Cocker and Burnet, so they can be treated as just about a second, more moderate, blue cluster, though in past years I wouldn't have done so. From here on it gets really messy. Cooper and Harvey have 70+ agreement percentages with Burnet, but not with Cocker, and my estimate is they wouldn't have done so with each other either. (I used an estimate of 66% for them). Reynolds agrees far more with Cooper, Cocker, Harvey and Burnet than with the above-identified "blue" groupings, but doesn't have an agreement percentage of 70+% with anyone despite having been elected as a Green. Harvey was also elected as a Green but is clearly closer to the centre than Cooper (not a capital-G Green). I think it would be too much of a stretch to put any of these in a cluster as such. One more thing I'd add concerning Denison is that I think her position is a lot bluer than the figures above indicate. I got a strong feeling working through the data that quite often when Denison voted with the Greens she was doing so for different and often opposite reasons to theirs. Noting that Harvey replaced Cooper midway through the term (which is close enough to like for like), through this term there were six councillors with relatively clear "blue" leanings, four with relatively clear "green" leanings, and two more or less in the middle. With the departure of Hickey late in the term, the "blue" side dropped to five. Given that many councillors don't tend that strongly to one side or the other, and also that it is fairly rare for all councillors to be present at a meeting, the outcomes of contested votes have been a lot less predictable than in the past. When we look back at graphs like 2011-2, where ten pairs had agreement percentages over 80% (some around 90%) the question is what is going on here to have made the alignments of Councillors so much less predictable. Firstly, this reflects a continuation of conflicts on the blue side. In the second half of the 2011-4 term it was notable that Hickey, Briscoe and Christie started voting less often with Thomas and Zucco. This seems to have continued, such that (for instance) it is quite common to see one of Briscoe or Thomas voting with the Greens, but if the motion is close then it is rare for both to do so. Secondly the lack of solidarity within the Greens has long been noticed, but has become even more pronounced in this term. In announcing she would run for Lord Mayor as an independent not a Green, Reynolds expressed surprise at the way the Greens do not always work together on the Council. Her calculation seems to be that if you're not going to get the benefits of party solidarity, why accept the downside of having your electoral appeal limited? Looking at the issues before the Council in this term there have been few big-picture environmental issues. It might be argued that so long as the Greens vote together on matters like the cable car it doesn't really matter if they record split votes on subdivisions, or a submission on compulsory voting, or a report on green waste outcomes, or the releasing of the Myer voting record, or pedestrian barriers, or free days at the aquatic centre, or (and those were just a bunch of quickly cherrypicked examples). It might even be pointed out that of the 254 (yes, 254) motions where the Greens voted non-unanimously (that includes lone dissents), there were only 121 where the Green(s) on the losing side were joined by anyone else, and in 73 of those they were only joined by one other Councillor. So mostly when the Greens are split it's no big deal - a lot of these might be just cases where some Greens bother to have their dissent recorded and others don't. A possible third factor, as compared to voting late last decade, is that during the last term the majority of councillors got sick of motions put on the agenda by the Greens to try to make the Council take stands on issues outside Hobart's borders. As a result such motions were excluded, I think by a change to standing orders, and are no longer seen. There were generally not all that many such motions but it's possible their disappearance has helped encourage a less factional culture over time. A principal components analysis tries to squash the variation of voting patterns into a limited number of key variables (in this case two). It reflects that difference in voting behaviour can be a result of a councillor having a different ideological perspective to another councillor, or of them having the same perspective but realised much less strongly. Greater distance from the centre indicates a more strongly realised pattern. The axes don't necessarily mean anything in particular, but it usually happens that one strongly picks up the green-blue split; in this case the other might be described as a measure of evenness across the board. The graph measures voting patterns relatively, so unlike the matrix it doesn't pick up the fact that voting patterns have become less predictable. On the right hand side, although Denison and Zucco had the highest agreement percentages, the graph has put Hickey between them, suggesting that Hickey responded to similar issues to Denison but was more moderate. This makes sense because Hickey and Denison are both current-day Liberals and I did see a few votes where them voting together (with few or no others) looked party-based. For Zucco's part, the results again show that ideologically he would be at home in the Liberal Party. However, his quest for Liberal preselection for the 2010 state election got the dalek treatment, possibly on account of his history of colourful headlines, and he quit the party in response. As if it wasn't obvious from the matrix, the PCA picks up that Damon Thomas' voting behaviour on this Council is an unusual mix of moderation and agreement with Zucco. However it undersells how distinctive Briscoe's voting pattern is - if I took it to three dimensions he would stand out more from the rest. At the present time most of the eleven remaining Councillors appear to be running for either Lord Mayor or Deputy Lord Mayor, though some have yet to announce to my knowledge whether they are recontesting at all. At some time in September I will be posting a candidate guide for the upcoming elections, which will be conducted by postal voting in October. This will also comment on prospects for the mayoral and deputy contests, once it is known who is running for what. The 2018 election may be dominated by the kunanyi/Mt Wellington cable car proposal, primitive versions of which also dominated the 1988 and 1994 elections (without having much obvious impact on the outcome.) However, the cable car is not a straightforward green/blue issue, with Jeff Briscoe (normally on the "blue" side) being one of the more stridently anti-CC councillors. The cable car therefore faces a tough slog to get sufficient numbers on council to get a development application approved, assuming one is ever actually submitted. We can expect pro- and anti-CC forces to be promoting candidates who they think will support their positions on the concept. Not entirely coincidentally - but probably also connected with Hickey's departure and the possibility of Denison being preselected for higher duties - the election will attract outside candidates with a Liberal background (I am aware of at least three of them already). The long incumbency of many councillors has received some comments, with the eleven incumbents having served an average of 14.5 years on council, and five having been first elected in the 1990s. Going through the large volume of complex motions processed by the council with a turnaround of only two weeks between meetings gives quite an impression of just how much work councillors do, but this is somewhat at odds with the media circus of some councillors saying silly things or picking fights in public. The new all-in all-out system makes it easier for distinctive outsiders to break into council, so if all eleven incumbents recontest then some incumbent losses are quite likely. I have doubts they all actually will recontest, but we will have to wait and see, with no retirements announced at this stage. Any comment on this article that reaches either me or anyone related to me will be considered on the public record, especially if stated otherwise. This is to prevent candidates from attempting to covertly influence my commentary. Interesting comments about HCC. Anna Reynolds boldly calls herself 'an Independent' rather than a Green on a leaflet we got recently but a Greens door-knocker told me that's because they chose to back Bill Harvey for mayor, not Reynolds. Is she still a Green, just not a Green on electoral material? What an insipid bunch of re-treads. Christie's mad but at least he's a harmless disruptor. I don't know whether Reynolds is still formally a member of the Greens or not. I have also heard the same claim that she decided to run outside the party because they wouldn't preselect her but I do not know if this is true. What's going on with the Greens? Another erstwhile Green, Andrea Dawkins, has announced she's running for deputy mayor in Launceston. She says she's no longer affiliated with them but will stand as a "proud" independent with Greens affiliation. There have been several past cases of Greens councillors getting elected under the party banner and then quitting to run as independents after 1-2 terms. However a state MP doing it is something new. Is Sexton still a member of the Labor party? Years ago he used to belong to the right faction but voted with Briscoe, Archer and Freeman. The political affiliations, especially the multiple consecutive memberships would make for interesting reading. I have no knowledge of Sexton's party memberships. Your analysis paints a very distorted picture. Everyone from Hickey to Cocker is Green or green, regardless of whether they voted this way or that way on some trivial motion. You would do better to analyze a few critical motions that really show their true priorities, like the reduction of Liverpool St to one lane, or the proposal to build a bike-lane on the Battery Point foreshore. Actually avoiding the sort of "very distorted picture" that results from looking at an unreliably small sample based on one person's assumptions about what are the "critical motions" is exactly why I do it the way that I do. If those are "critical motions" because they are supposedly the most important, other people wouldn't agree with that. If they are critical because they are the most indicative then their pattern would be repeated elsewhere. The support of the motions I mention by your so-called non-green faction is a reductio ad absurdum or your method and conclusion that they are not green. No it isn't. A person can support green attitudes on a small number of issues while not supporting them on most and it would be ludicrous to classify such a person as a green. If one did, a lot of people would be greens, even in the Liberal Party. Future comments that simply assert a criticism without defending it will not necessarily be accepted. Hickey has pretty consistently voted more like a Green than a classic Liberal Party member on motions that concerned environmental and heritage preservation and the primacy of pedestrians and cyclists. She was the second choice by a large margin among Liberal voters in Dennison. And she crossed the floor of state parliament within weeks of being elected. So it's not at all 'ludicrous' to characterise her as a greenie. You have included in your analysis motions, the vast majority of which I'd bet could not be classified as concerning environmental issues. It's as if you set out to show which councillors were the most tall, but instead of just relying on a measurement of height, you took an average of weight, hair colour, shoe size, age and dozens of other irrelevant variables. You seem to want to restrict what counts as an "environmental issue" while also broadening it whenever you like, which is self-contradictory. Strictly speaking "heritage preservation" is not a pure environmental issue. Pedestrian and cyclist issues may be environmental or may not depending on whether one supports them because one believes they are good for the environment, or because one believes they are best for giving people multiple transport options (it could be either reason or both.) Likewise many of the common issues involving subdivisions, building alterations and house approvals - which you might not see as environmental issues - are often seen by those opposing such proposals as about their local environment. What someone has done in state parliament is irrelevant to an analysis of their council behaviour but in any case Hickey has not yet crossed the floor to my knowledge on anything but personal ambition. Looking at my list of motions the very first on the list is a vegetation clearance on Huon Road. Hickey your supposed greenie was on the losing side of that one with Zucco, Sexton, Thomas and another of your supposed greenies Briscoe (Denison absent). I suspect I will find other such examples when I have time to check them later. The clearing of Huon Road vegetation is less of a green issue than many others, and more of a matter of road safety vs expense. Who supported the multi-million dollar pedestrian bridges just a few metres from existing underpasses? Who supported the Domain walking tracks? Who supported solar panels for the Aquatic Centre? Who supported the reduction of Liverpool St to one lane? Who opposed the creation of clear-ways on Davey St & Macquarie St? Who widened the footpath and created a bus stop partially blocking a lane on Macquarie St when there's a ton more room than needed for a footpath in front of Town Hall? You seem to think you're being objective, but whether you label one group blue or just another shade of green is really a subjective choice, and I'd argue a very poor one. My sample only includes contested votes not unanimous votes, and only includes this term of Council. It also doesn't include noises made outside Council - it includes voting on the floor of Council (not committee) on contested votes. So, Domain walking tracks, solar panels for Aquatic Centre, Macquarie St footpaths - all not in the sample according to my brief summaries of what the votes were. Clearways on Davey and Macquarie - in the sample but Hickey no longer on council (the dissenters on that motion were two of the four Greens but not the other two, and also Thomas.) Liverpool St - there are a few Liverpool St votes but I don't think the reduction was one of them, and in any case Hickey didn't vote unusually on those. It's not impossible for me to miss the odd motion but if you think one was missed tell me the date - all minutes are available on the HCC website except those from 2014-5 which can be accessed by the Wayback Machine or requested from the Council. The labels are subjective (unlike the voting patterns) but I think it's entirely reasonable to call a side "green" if those who vote most strongly that way are endorsed Greens. And I also think that if someone votes with Marti Zucco more often than they vote with endorsed Greens then to consider them to be green on account of some cherry-picked issues is absurd. That some Liberal-aligned councillors in a very pro-green city are more likely to now and then vote in a "pro-environmental" way than those elsewhere is not telling anyone the news and is reflected in the patterns anyway. Cocker & Burnett only agreed with each other 78% of the time, and Reynolds & Harvey agreed with those two only 67-71% of the time. That's pretty clear evidence that many of the motions you've counted in your analysis of 'greenness' were not one dimension or even about green issues. If you only consider the motions when the Greens (current and technically former) were unanimous, I would have a little more faith that the results would be correlated to actual greenness in voting on green issues, although even that would still liable to be influenced by irrelevant non-green-related motions. You raised a point about heritage earlier. I agree that heritage is not a true green issue, yet you would be hard pressed to find a green councillor anywhere in the country who would not jump on the band-wagon if protests arose in response to a proposed development that required heritage demolition. 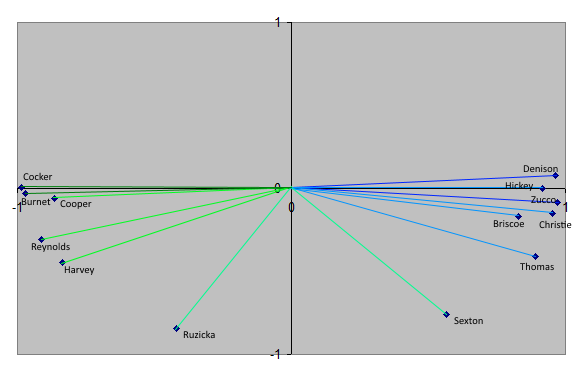 I'd also exclude the Greens + Reynolds from the component analysis, then your 'blue' & 'green' labels would fit. It's not an analysis of "greenness". I don't *set out* to determine who the greenest councillors are. I set out to determine what relationships in the voting exist and then I look at how they might be classified. It just happens that every time I have done this for Hobart council it has come up with a pattern that puts endorsed Greens at one end, and the more staunchly pro-development/business types at the other. Just as every time I have done it for the Legislative Councillors they end up falling into a "left" side that includes Labor MLCs and a "right" side that includes Liberals. Of course there are motions that are irrelevant to the green-blue axis, otherwise there would be scores closer to 100% or 0%. The point is to make a classification that considers all voting - votes that may as well be random because they have no political or personality dimension are just noise in a sample this large. They weaken the percentages but they don't alter the order. Just looking at issues where the Greens were unanimous would be useless in separating the Greens from each other even though there is a wide variation in voting behaviour between them (and there are plenty of issues they are split on that could be called "environmental" and plenty they are unanimous on that are not). All it would do is rank the rest in terms of how often they agree with the Greens on issues where they are unanimous. As those votes are the stronger signal in the matrix anyway it would be highly unlikely to say anything that we do not already know. "they don't alter the order" / including irrelevant motions doesn't alter the order on the green/blue spectrum - That's an assumption. No it's an informed conclusion from someone who has worked with the data and is knowledgeable about statistics and probability. This is a large data set and the number of effectively "random" motions is not that great. Comment above rejected pursuant to previous warning: "Future comments that simply assert a criticism without defending it will not necessarily be accepted." You call cherry-picking motions absurd, but I say if you want to compare heights then you're best off measuring directly rather than taking the average of half a dozen things that may or may not be correlated. "if you want to compare heights" is an incorrect assumption for the reason stated above. Note on attendance rates: I received a message from the current Deputy Lord Mayor Peter Sexton concerning my assessment of attendance rates at missed votes. He requested a correction of his attendance rate to 79.56% based on being shown in council reports as having attended 74/93 meetings. It was actually very clear that I was referring to attendance at contested motions only, but nonetheless I have changed the word "attendance" to "% Voted On" and made some minor changes to the surrounding text, just to reduce any risk that might exist of any very easily confused readers becoming confused. However I will not be using raw attendance rates at meetings as an indicator of participation. They oversimplify the story because they take no account of whether councillors were present for some of the voting or all of it (either because of forced abstentions or because of leaving or arriving partway through). The discrepancy between Sexton's voting rate on contentious motions and his raw attendance rate is partly explained by those meetings he missed completely having had an average of 7.6 contested motions, vs 5.7 for all meetings in my sample. But for this his participation rate on contested motions would have been around 74%. However it is also partly explained by him having been present for some contested motions but not all at nine of the 87 meetings in my sample. If we count such a meeting as a half (as a crude average) then his meeting attendance rate for the meetings in my sample would also be 74%.